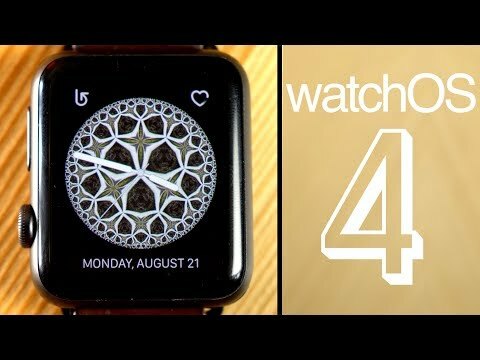 watchOS 4 is now available to install via the Watch app on a paired iPhone. It requires an handset device running the newly released iOS 11. Perhaps the biggest standout feature of watchOS 4 is the new Siri watch face, which proactively displays information relevant to the user throughout their day, ranging from weather to calendar entries to breaking news items. Apple has also revamped the music app, focusing on tracks stored on the Apple Watch first and foremost -- a precursor for streaming music support coming next month with the LTE-equipped Apple Watch Series 3. For those with current watch models, a new automatic sync feature will transfer curated Apple Music playlists, making sure users can listen to them when their iPhone is not nearby. For those who play music stored on or streamed from their iPhone, watchOS 4 also introduces a new Now Playing view that automatically appears when a user raises their wrist. Now Playing appears regardless of the source of content, as long as they integrate with iOS default media playback controls. Apple's Activity app has also been enhanced with personalized progress updates, letting the wearer know when they are closing in on achievements and sending reminders in the evening to close out rings. The Activities feature also has personalized monthly challenges, and offers more dynamic celebration animations when more impressive achievements are reached. watchOS 4 makes the Workout app easier to use with new quick start capabilities, letting users start their workout immediately with just a tap. The update also adds support for high intensity interval training, featuring custom heart rate and motion monitoring. Apple Watch also gains enhanced swim tracking, automatically tracking sets and rests, pace for each set, and distance for each stroke type. watchOS 4 automatically enables Do Not Disturb when the wearer begins a workout, so exercise sessions won't be interrupted by texts, calls or push notifications. Compatible gym equipment can automatically sync with an Apple Watch running watchOS 4, tracking metrics like heart rate, speed, and calories. And users can also switch between workouts quickly when doing activities like a triathlon. Other new features include the kaleidoscope watch face, and another face featuring Woody, Buzz Lightyear and Jessie from "Toy Story." The News app has also been brought to watchOS 4, and support for Apple Pay Cash and person to person transfers will arrive later this year. Can anyone confirm this update is compatible with the first generation Apple Watch? My watch app says my watch is up to date. Edit: My bad, have to update iOS first, duh. If I remember right from watchOS 3, if you installed the iOS public beta on your phone and also said yes to installing the watchOS beta profile (even though you couldn't install a watchOS beta), that prevented me from even seeing that the release version of watchOS was available. To fix it, go into the Watch app on your phone and look for a "Profiles" setting. If you see the beta profile there, simply delete it, then try to update again. Given the $10 monthly data fee, let’s see if AT&T, Verizon, T-Mobile and other carriers start promoting new generation watch in stores and online. With enhanced Siri, boosted ecosystem, etc, etc. could be biggest incentive yet to convert Android users who wouldn't normally stroll into an Apple store. Thank you. You might have just saved me from going insane. How can an update for such a little device take so long! Watch updates have always taken ridiculously long times to download and install but WatchOS4 sets a new record. Started off by saying estimated time of 4 hours (! ), which quickly reduced to 1 hour. But since then it has indeed been an hour. How can their servers be that screwed up? iPhone and watch now upgraded. Playing with watch the most. Switchecd to app list right away, and am trying out Siri face. Was sort of looking forward to fireworks when rings were closed, since I missed that from my old Vivosmart, but it did not happen. In fact, I got no notification at all. Because tens of millions are updating at the exact same time... Yeah, think about it. Another possible reason is that if it is a small device, there is isn't much space available to move things around and the CPU and storage is pretty slow. Everything put together means it is slow. It’s ridiculous how long it takes to update. I’m going on an hour and a half now and have a half hour to go! Also apparently there’s an issue with the LTE version of the Watch. WSJ reviewed the device and didn’t recommend it; The Verge had issues to and gave it a 5/10. Apple says will be fixed with a future software update but didn’t say when. Honestly I’m seeing less and less of a reason to get an LTE Apple Watch. The negatives outweigh the benefits and I’m rarely some place where I don’t have my phone with me. I’m not convinced the Watch can ever truely be a stand alone device. Certainly not when LTE is such a drain on the battery. Is there a list somewhere of "compatible gym equipment"? I was just about to search for the same thing. This would be awesome if it worked everywhere my polar bands do currently. The Verge took a dump in the mouth of the original series 0, Patel lying, distorting all the way trough his review. It's basically the worse (not just in sense of negativity) review I have ever seen ever. Just a complete turd of a review in form and content too. Even now, they lie about how much effect the bug has (funny how only them actually mention it in their reviews). So, they are certified LIARS with a distinct Patel is a clown and their site has the integrity of a mop. The LTE watch has other advantages, that mitigates the drain, seemingly a better chip is one of them. It has also more memory. Its only $70 more than the GPS one, if your not using the LTE (until Apple fixes the software) you'd get a much longer standby time than with the Series 2.